Surfing everyday down here. The point always has something to ride and the spots down the road are the go-to in the morning. When we first pulled in we caught the tail end of the last big south that came through; surf was head a half to double overhead pushing hard and lining up. It came down a bit since then but, like I said, there's been something to surf everyday- that's just how it is down here, definitely a wave magnet. 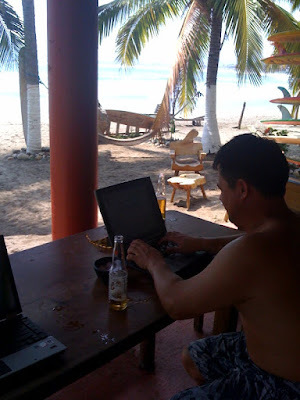 Photo: Here's me, working; satellite wireless, cold ones just a few steps away. And the most unreal pancakes I've ever had- I could get used to this. Been receiving multiple reports of a big swell coming soon- couple of days out and it should be roping through here. It might get interesting on the point. Even when it's two foot the wave holds and pushes hard enough for you to wrap cutback after cutback- if it jumps up to eight foot, things could become a little more intense. As long as I can get to this wireless node I'll post more up, stay tuned. Will do... the boys are going to be back here from a little run up the coast tomorrow. The girls will be here too. Pictures and words to follow. This is cool - I love the internets. Is Chad taking care of that lawn while you're gone? Have fun and stay safe. You're not missing much at DOgpatch. More o' the same down here, you know the routine. Surfed El Rancho this morning and then went to completion on pancakes and huevos mexicanos, couldn't help myself... killed it. Chad should be here any moment... so lawn is neglected and my mower died. Looks like it'll be a serious day of clean up when I get back. Surf is picking up.... super fun on the stand up- all the waves you want, nobody to bother you- all you got to do is paddle away.... you'd love this place. This internet connectivity is too much. The general communication rule from Mainland used to be simply "Mom- if you don't hear anything, don't worry". Don't worry Kelly it's a real sketchy link and it's down most of the time.... but it's got an UNREAL view of a left hand point break... and some cold beers too. kelly tell john to watch out for carla from nexpa.captneg9. Don't take any cap from Lourdes. And don't let Corky see you on a SUP. It can get ugly. Was sitting in the same place as you, with my laptop in March. Stayed next to the house of waves. Great place. Visit the grade school in town. They'll treat you like a rock star if you bring supplies. Great little town. Enjoy it.